Today was the surprise party for my parents’ 25th anniversary. It was a fun event. Family came in from out of town and my grandma and aunt arranged for my parents to be sent on a cruise in May. It was nice to see lots of family again. 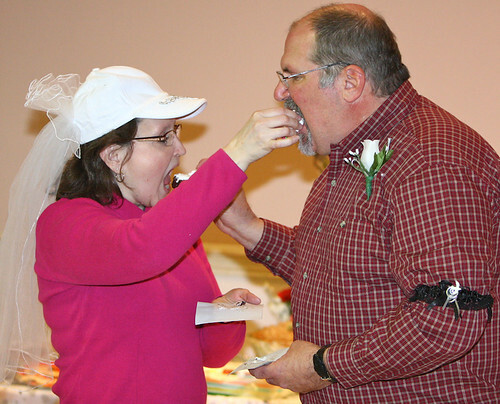 Here my parents are, still wearing the “mock wedding” attire put on them, doing the ceremonial feeding of the cake to each other. Their actual anniversary is on Feb. 18, but today was a good day to have everyone get together. Today was also Valentine’s Day. Before my parents’ party, I spent a wonderful late morning/early afternoon with Amanda. I will be back up to Hillsdale Sunday night, after I go to the History and Current Events Seminar here at home that I used to be a part of. The group is discussing P. J. O’Rourke’s On the Wealth of Nations. It should be interesting. Since I have read Adam Smith’s Wealth of Nations, I will discuss some of my thoughts on the historic book and O’Rourke’s explanations.